Techotopia is a library of free on-line IT books covering a wide range of topics including iOS and Android app development, operating systems, programming, scripting, system administration, databases, networking and much more. The IT Essentials series of books is designed to provide detailed information that is accessible to both experienced and novice readers. Each on-line book contains everything that is needed to gain proficiency in the corresponding technology subject area. Android Studio 3.2 Development Essentials - Java Edition Fully updated for Android Studio 3.2, Android 9 and Android Jetpack, the goal of this book is to teach the skills necessary to develop Android based applications using the Android Studio 3.2 Integrated Development Environment (IDE) and the Android 9 Software Development Kit (SDK). The aim of iOS 11 App Development Essentials is to teach you the skills necessary to build your own applications for the iPhone and iPad using Xcode 9, the iOS 11 SDK and the Swift 4 programming language. Beginning with the basics, this book provides an overview of the architecture of iOS 11. Introductions to Xcode 9 and programming in Swift 4 are provided followed by an in-depth look at the design of iOS applications and user interfaces. More advanced topics such as user interface layout, file handling, database management, graphics drawing and animation are also covered, as are touch screen handling, multitasking, in-app purchasing, iCloud storage, CloudKit, App Extensions, camera access and video playback. Other features are also covered in detail including 2-D game development using Sprite Kit, user interface animation using UIKit Dynamics, Siri integration and drag and drop support. Kotlin / Android Studio Development Essentials Fully updated for Android Studio 3.0 and Android 8, the goal of this book is to teach the skills necessary to develop Android based applications using the Android Studio Integrated Development Environment (IDE), the Android 8 Software Development Kit (SDK) and the Kotlin programming language. Firebase Essentials - Android Edition provides everything you need to successfully integrate Firebase cloud features into your Android apps. This book covers the key features of Android app development using Firebase including integration with Android Studio, User Authentication (including email, Twitter, Facebook and phone number sign-in), Realtime Database, Cloud Storage, Firebase Cloud Messaging (both upstream and downstream), Dynamic Links, Invites, App Indexing, Test Lab, Remote Configuration, Cloud Functions, Analytics and Performance Monitoring. The book is organized into chapter groups that focus on specific Firebase features, with each topic area consisting of a detailed overview followed by tutorial style examples that put theory into practice. The aim of iOS 10 App Development Essentials is to teach you the skills necessary to build your own applications for the iPhone and iPad using Xcode 8, the iOS 10 SDK and the Swift 3 programming language. Beginning with the basics, this book provides an overview of the architecture of iOS 10. Introductions to Xcode 8 and programming in Swift 3 are provided followed by an in-depth look at the design of iOS applications and user interfaces. More advanced topics such as user interface layout, file handling, database management, graphics drawing and animation are also covered, as are touch screen handling, multitasking, in-app purchasing, iCloud storage, CloudKit, App Extensions, camera access and video playback. Other features are also covered in detail including 2-D game development using Sprite Kit and user interface animation using UIKit Dynamics. 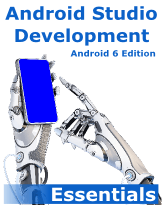 Android Studio Development Essentials - Android 6 Edition is an online book designed to teach the skill necessary to develop Android apps using Android Studio and the Android 6 SDK. The goal of this book is to teach the skills necessary to develop Android based applications using the Android Studio Integrated Development Environment (IDE) and the Android 6 Software Development Kit (SDK). Beginning with the basics, this book provides an outline of the steps necessary to set up an Android development and testing environment. An overview of Android Studio is included covering areas such as tool windows, the code editor and the Designer tool. An introduction to the architecture of Android is followed by an in-depth look at the design of Android applications and user interfaces using the Android Studio environment. More advanced topics such as database management, content providers and intents are also covered, as are touch screen handling, gesture recognition, camera access and the playback and recording of both video and audio. This edition of the book also covers printing, transitions and cloud-based file storage. The concepts of material design are also covered in detail, including the use of floating action buttons, Snackbars, tabbed interfaces, card views, navigation drawers and collapsing toolbars. The aim of iOS 9 App Development Essentials is to teach you the skills necessary to build your own applications for the iPhone and iPad using Xcode 6, the iOS 8 SDK and the Swift programming language. Beginning with the basics, this book provides an overview of the architecture of iOS 9. Introductions to Xcode 7 and programming in Swift are provided followed by an in-depth look at the design of iOS applications and user interfaces. More advanced topics such as user interface layout, file handling, database management, graphics drawing and animation are also covered, as are touch screen handling, multitasking, in-app purchasing, iCloud storage, CloudKit, App Extensions, camera access and video playback. Other features are also covered in detail including 2-D game development using Sprite Kit and user interface animation using UIKit Dynamics. Additional features of iOS development using Xcode 7 are also covered, including Swift playgrounds, universal user interface design using size classes, app extensions, Interface Builder Live Views, embedded frameworks, CloudKit data storage and TouchID authentication. The key new features of iOS 9 and Xcode 7 are also covered in detail, including new error handling in Swift 2, designing Stack View based user interfaces, multiple storyboard support, iPad multitasking, map flyover support, 3D Touch and Picture-in-Picture media playback. 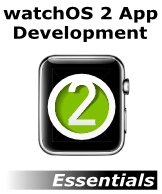 watchOS 2 App Development Essentials is intended for readers with some existing experience of iOS development using Xcode and the Swift programming language. Beginning with the basics, this book provides an introduction to watchOS apps and the WatchKit app development architecture before covering topics such as tables, navigation, user input handling, image handling, animation, maps and menus. More advanced topics are also covered throughout the book, including communication and data sharing between a WatchKit app and the parent iOS app, working with custom fonts and the design and implementation of custom notifications and complications. The aim of iOS 7 App Development Essentials is to teach you the skills necessary to build your own applications for the iPhone and iPad using Xcode 5 and the iOS 7 SDK. Beginning with the basics, this book provides an overview of the architecture of iOS 7. Introductions to Xcode 5 and programming in Objective-C are provided followed by an in-depth look at the design of iOS applications and user interfaces. More advanced topics such as user interface layout, file handling, database management, graphics drawing and animation are also covered, as are touch screen handling, multitasking, in-app purchasing, iCloud storage, camera access and video playback. New iOS 7 specific features are also covered in detail including 2D game development using Sprite Kit and user interface animation using UIKit Dynamics. Beginning with the basics, iPhone iOS 5 Development Essentials provides an overview of the iPhone hardware and the architecture of iOS 5. An introduction to programming in Objective-C is provided followed by an in-depth look at the design of iPhone applications and user interfaces. More advanced topics such as file handling, database management, graphics drawing and animation are also covered, as are touch screen handling, gesture recognition, multitasking, iAds integration, location management, local notifications, camera access and video and audio playback support. New iOS 5 specific features are also covered including page view controller implementation, iCloud based storage, Storyboard user interface design, image filtering with Core Image and Twitter integration. Beginning with the basics, iPad iOS 5 Development Essentials provides an overview of the iPad hardware and the architecture of iOS 5. An introduction to programming in Objective-C is provided followed by an in-depth look at the design of iPad applications and user interfaces. More advanced topics such as file handling, database management, graphics drawing and animation are also covered, as are touch screen handling, gesture recognition, multitasking, iAds integration, location management, local notifications, camera access and video and audio playback support. New iOS 5 specific features are also covered including page view controller implementation, iCloud based storage, Storyboard user interface design, image filtering with Core Image and Twitter integration. Now fully updated for Modern Objective-C, the goal of this book is to teach the skills necessary to program in Objective-C using a style that is easy to follow, rich in examples and accessible to those who have never used Objective-C before. Topics covered include the fundamentals of Objective-C such as variables, looping and flow control. Also included are details of object oriented programming, working with files and memory and the Objective-C Foundation framework. Regardless of whether you are developing for Mac OS X or the iPhone, this book covers everything you need to know about the Objective-C language. The aim of this book is to teach you the skills necessary to build your own apps for the iPhone using the iOS 3 version of iPhone SDK and the Xcode development enviroment. WatchKit App Development Essentials is intended for readers with some existing experience of iOS development using Xcode and the Swift programming language. Beginning with the basics, this book provides an introduction to WatchKit apps and the WatchKit app development architecture before covering topics such as tables, navigation, user input handling, image handling, animation, maps and menus. More advanced topics are also covered throughout the book, including communication and data sharing between a WatchKit app and the parent iOS app, working with custom fonts and the design and implementation of custom notifications. The goal of Android Studio Development Essentials is to teach the skills necessary to develop Android based applications using the Android Studio Integrated Development Environment (IDE) and the Android 4.4 Software Development Kit (SDK). Beginning with the basics, this book provides an outline of the steps necessary to set up an Android development and testing environment. An overview of Android Studio is included covering areas such as tool windows, the code editor and the Designer tool. An introduction to the architecture of Android is followed by an in-depth look at the design of Android applications and user interfaces using the Android Studio environment. More advanced topics such as database management, content providers and intents are also covered, as are touch screen handling, gesture recognition, camera access and the playback and recording of both video and audio. This edition of the book also covers features introduced with Android 4.4 including printing, transitions and cloud-based file storage. In addition to covering general Android development techniques, the book also includes Google Play specific topics such as implementing maps using the Google Maps Android API, in-app billing and submitting apps to the Google Play Developer Console. Chapters also cover advanced features of Android Studio such as Gradle build configuration and the implementation of build variants to target multiple Android device types from a single project code base. Assuming you already have some Java programming experience, are ready to download Android Studio and the Android SDK, have access to a Windows, Mac or Linux system and ideas for some apps to develop, you are ready to get started. The goal of Android 4.4 App Development Essentials is to teach the skills necessary to develop Android based applications using the Eclipse Integrated Development Environment (IDE) and the Android 4.4 Software Development Kit (SDK). Beginning with the basics, this book provides an outline of the steps necessary to set up an Android development and testing environment. An introduction to the architecture of Android is followed by an in-depth look at the design of Android applications and user interfaces. More advanced topics such as database management, content providers and intents are also covered, as are touch screen handling, gesture recognition, camera access and the playback and recording of both video and audio. In addition to covering general Android development techniques, the book also includes Google Play specific topics such as implementing maps using the Google Maps Android API and submitting apps to the Google Play Developer Console. The goal of Kindle Fire App Development Essentials is to teach the skills necessary to develop Android based applications for the Kindle Fire family of devices. Beginning with the basics, this book provides an outline of the steps necessary to set up an Android development environment. An introduction to the architecture of Android is followed by an in-depth look at the design of Android applications and user interfaces. More advanced topics such as database management, content providers and intents are also covered, as are touch screen handling, gesture recognition, camera access and the playback and recording of both video and audio. The VMM 2008 Essentials on-line book covers the installation, deployment and management of virtualized infrastructures using Microsoft System Center Virtual Machine Manager 2008 (VMM 2008), including an overview of the VMM 2008 architecture, the VMM Administrator Console, creation of virtual machine templates, deploying Self-Service Portals, configuring VMM Libraries and performing both P2V and V2V conversions. Hyper-V Essentials covers the installation, deployment and management of virtualized infrastructures using Microsoft Hyper-V technology. Included in this publication are chapters on creating and configuring virtual machines, Hyper-V architecture, virtual network configuration, Hyper-V Integration Services, remote access, the Hyper-V Manager and much more. VMware Server 2.0 Essentials is an online book intended as both a learning resource and reference guide designed to be of use to new and experienced VMware Server users alike. Comprising 20 chapters of detailed information, the book covers a wide range of topics relating to this entry level virtualization solution. Xen Virtualization Essentials is an online book which takes a practical approach to learning about and deploying Xen based virtualization solutions. The book covers a wide range of Xen virtualization related topics including the creation and configuration of both paravirtualized and HVM guests, and the ongoing configuration and maintenance of the virtualized environment. Consisting of over 30 chapters of detailed, in depth and practical information, Windows Server 2008 Essentials is intended to cover all aspects of installing, configuring and administering Windows Server 2008 systems. Whether you are new to Windows Server or upgrading from Windows Server 2003, this on-line book is designed to help the reader traverse the learning curve as rapidly as possible. Windows PowerShell 1.0 Essentials is an online book intended to cover everything necessary to rapidly gain proficiency using the Windows PowerShell scripting and Shell environment. The book consists of 25 chapters of detailed information on this powerful new tool for Windows system administrators. CentOS 6 Essentials is intended to provide detailed information on the use and administration of the CentOS 6 distribution. For beginners, the book covers the basics of configuring the desktop environment, resolving screen resolution issues and configuring email and web servers. Installation topics such as network installation and dual booting with Microsoft Windows are covered together with all important security topics such as configuring a firewall, use of the shell environment and user and group administration. For the experienced user, topics such as remote access, logical volume management (LVM), disk partitioning, swap management, KVM virtualization, Secure Shell (SSH) and file sharing using both Samba and NFS are covered in detail to provide a thorough overview of this enterprise class operating system. The purpose of this book is to provide an overview of the essential knowledge required to use and maintain an Ubuntu 11.04 system. Designed both as a learning tool and a reference guide, it is intended that Ubuntu 11.04 Essentials provide the reader with a sound basis of knowledge for installing, using and maintaining an Ubuntu 11.04 system. Ubuntu Linux Essentials provides the knowledge required to use and maintain an Ubuntu Linux system. From the basics of installation, configuring the desktop and implementing wireless networking through to tasks such as configuring firewalls, setting up a web server and providing remote desktop access via an SSH tunnel, Ubuntu Linux Essentials takes a step by step approach to installing, using and administering Ubuntu Linux. Ubuntu Desktop Essentials is designed to cover everything that a user needs to know to use and customize the Ubuntu GNOME desktop. In terms of usability, guided tour provides a detailed overview of the how the desktop works. The book then provides step by step tutorials covering every aspect of customizing the desktop, from changing the background and desktop themes to activating and configuring the new Compiz Fusion desktop visual effects. Chapters are also dedicated to topics such as changing fonts, setting up keyboard shortcuts, enhancing the desktop with desklets, configuring and saving sessions and customizing the file manager. The objective of the book is to provide the reader with the necessary information to use, customize and configure the GNOME desktop on a Fedora system. This book is intended as a companion to the Fedora Linux Essentials book which covers the use and maintenance of the underlying Fedora operating system. The book is designed to provide everything a user needs to know to customize, configure and use the GNOME desktop on a Fedora Linux system. Fedora Linux Essentials provides detailed information on the use and administration of Fedora Linux. The book covers the basics of configuring the desktop environment, resolving screen resolution issues and configuring the email client to send and receive email messages via web based services such as GMail. Installation topics such as dual booting with Microsoft Windows and configuring wireless networking are covered together with all important security topics such as configuring a firewall. For the experienced user, configuring email and web servers, Xen virtualization, Secure Shell (SSH), remote desktop access and file sharing are described in detail. This purpose of this book is to cover all aspects of the use and configuration of the openSUSE GNOME desktop environment. Topics covered include changing the openSUSE GNOME Desktop background, installing and customizing themes, configuring fonts, configuring workspaces, remote access to the openSUSE desktop and much more. On completion of this book, it is hoped that the reader will be confidently using and configuring the openSUSE implementation of the GNOME desktop. C# Essentials The C# Essentials online book contains 27 chapters of detailed information intended to provide everything necessary to gain proficiency as a C# programmer. The book begins with a detailed overview of the C# development and runtime environment with overviews of the Common Language Infrastructure (CLI), Common Intermediate Language (CIL) and Virtual Execution System (VES) followed by simple steps to creating both Windows and console based C# applications. A number of chapters are dedicated to the fundamentals of the C# programming language, including topics such as variables, constants, operators, flow control, looping and object oriented programming (including topics such as inheritance and abstract classes). Subsequent chapters focus on issues such as manipulating and formating strings and working with arrays and collection classes. Once the basics of the C# language have been covered the final stages of the book focus on the design of GUI based applications using C# in conjunction with Visual Studio. Ruby Essentials is a free on-line book designed to provide a concise and easy to follow guide to learning Ruby. Everything from installing Ruby and the basics of the language through to topics such as arrays, file handling and object-oriented programming are covered, all combined with easy to understand code examples which serve to bridge the gap between theory and practice. Ruby Essentials is intended to be of equal use both to those experienced in other programming languages and to novices who have chosen Ruby as their "first programming language". Visual Basic Essentials is intended to provide everything the aspiring Visual Basic programmer needs to get up to speed with this language. Chapters include the installation of Visual Studio, Variable and Constant types, looping and flow control, Visual Basic string manipulation, form designing, database access, working with arrays, graphics drawing and much, much more. PHP Essentials is intended to cover all aspects of PHP. It begins by covering the history of PHP before providing a high level overview of how PHP works and why it is so useful to web developers. It then moves on to cover each area of PHP in detail, from the basics of the scripting language through to object oriented programming, file and filesystem handling and MySQL and SQLite database access. In addition, chapters are also provided covering the creation and handling of HTML based forms and maintaining state using cookies and PHP sessions. All topics are accompanied by extensive real world examples intended to bring theory to life. It is not an exaggeration to say that MySQL has brought the power of a fully featured, scalable relation database management system into the reach of anyone with a computer and the desire to build a data driven application or web site. With this goal in mind, MySQL Essentials is designed to provide a step by step path to proficiency with MySQL. Beginning with the basics of relational databases and the installation of MySQL, the book goes on to cover everything needed to successfully build, maintain and secure MySQL based databases. Security+ Essentials is an online book designed for both those studying for the CompTIA Security+ exam and for those interested in learning key issues involves in designing and implementing secure IT environments. Security+ Essentials is largely a platform agnostic book and as such many of the concepts described apply equally to a range of popular operating systems including Windows, Linux, MacOS X and UNIX. On completion of this book it is intended that the reader will have a clear understanding of both the threats faced by IT infrastructures together with a basic understanding of the steps involved in planning and implementing a comprehensive multi-layered IT security strategy. Android Studio 2 Development Essentials is currently under development. Android Studio Development Essentials - Android 7 Edition is currently under development. This page was last modified on 16 January 2019, at 19:16.